20 years ago UNStudio came up with the masterplan for redevelopment of Arnhem Central Station, in the Netherlands, a candidate to become a major railway hub linking Germany with the Netherlands and Belgium. The new terminal was recently completed, replacing the previous one built in 1950, and it has now become the gateway to the city. The new Transfer Terminal features service areas, retail outlets, a congress centre and an underground parking lot. It is linked with the city centre and Sonsbeek Park and set in an area with shops, offices and multiplex cinemas, representing the biggest post-war reconstruction project the city has ever seen. What is unusual about the building’s architecture is the geometry of the structure . The structural roof is twisted to obtain large bays measuring up to 60 m with no intermediate vertical supports. 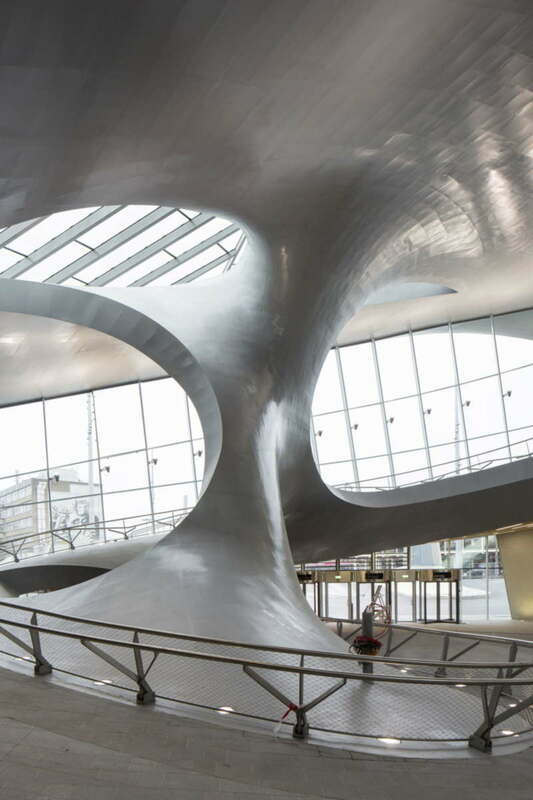 Inspired by a particular geometric solid, the Klein bottle, the architects of UNStudio have designed a volume in which the boundaries between interior and exterior disappear, a big fluid space in which there is a continuous exchange between surfaces: floors, walls and ceilings. The construction is made possible by use of construction technologies traditionally used in ship-building applied on a larger scale than has ever been attempted before. Ben van Berkel with Arjan Dingsté, and Misja van Veen, Marc Hoppermann, René Toet, Kristoph Nowak, Tobias Wallisser, Nuno Almeida, Marc Herschel, Rein Werkhoven, Matthew Johnston, Sander Versluis, Derrick Diporedjo, Ahmed El-Shafei, Juliane Maier, Daniel Gebreiter, Uli Horner, Freddy Koelemeijer, Kirstin Sandner.